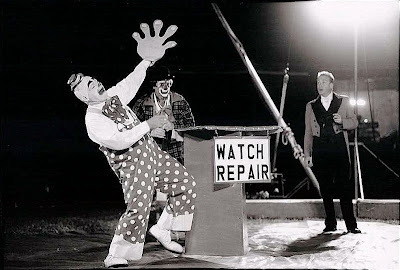 More great photos just arrived from the Billy Vaughn Archives, these are of Billy and Mike performing the Watch Repair Gag on Vidbel's Olde Tyme Circus. Vidbel's is rumored to be returning to the road this fall. A short documentary about clown Milko of the Dutch national circus Herman Renz. This version has been shortened for YouTube with respect to the original version of 14 minutes. A strange X-faced clown makeup that gives Chesty Mortimer and Jerry Bangs a run for their money in our annual Halloween post. I can't make out the entire signature but you can make out "Harold D". It reads, "To Lawrence Swalley the "Prince of Joy" ??? a sad rival, Harold D?????? season 1925 & 26". Anyone know more about the mysterious "Harold D"? Take a look at this footage of Joe Penner (which starts after the musical number featuring thousands including Jack Oakie and Franklin Pangborn) from the 1934 film College Rhythm and tell me that Jerome "Curly" Howard wasn't studying and absorbing Penner's unique physicality the way that Lou Costello was absorbing Curly's just a few years later. Penner strikes me as the early talkies manic answer to the silent persona of Harry Langdon. Penner died very young (in 1941 at the age of 37) after his popularity had run it's course. It would have been very interesting to see him, had he lived, hosting children's afternoon television in the 1950s (a la Pinky Lee), finding a new audience and asking a whole new generation of kids if they'd wanna buy a duck. The comedy magic of Roy Benson, who reminds me quite a bit of Wally Boag (or maybe Wally Boag reminds me of Roy Benson) on television in 1955. 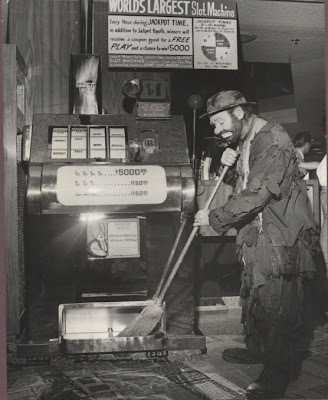 Emmett Kelly promoting an appearance in Reno, NV, undated. My guess is that this would have to be sometime in the late 50s or early 60s. Well, someone else out there has been studying Charlie Cairoli as well. I was wondering if you could help me find more information about Tom & Everett Hart. They are my father's grand uncles. Does anyone out there have any information on on Tom & Everett Hart? 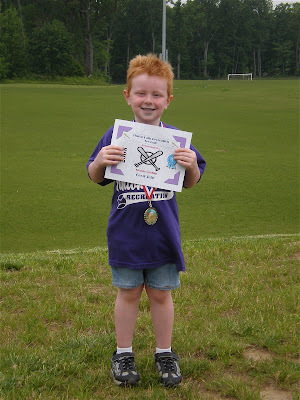 Shane Cashin proudly displaying his certificate and medal upon the completion of his first season of t-ball. In his final game he knocked three into the outfield in four at bats. A huge amount of the Edwin "Poodles" Hanneford estate has been generously donated to the International Clown Hall of Fame. The collection now includes several costumes, boxes of photos and news clippings as well as props. Many of the whips that Poodles used in his act are now in the ICHOF's storage facility waiting to be displayed when they move to their permanent home next year. An undated photo of The Prince in mid-makeup. Grock's famous leap through the chair. Is there anyone in the Sarasota/Gibsonton FL area who knows anything about what's become of Hip Raymond's car and props? Someone had mentioned to me about a year ago that they might become available but I haven't heard anything since. I'm very interested in expanding that act and taking it back out on the road. Please drop me a line at cashincomedy@yahoo.com. The old standard, stretched beyond belief, by a guy dressed as Austin Powers. I am extremely honored to announce Greg DeSanto and I have been asked by the Board of Directors to become Associate Board Members and Official Historians to the International Clown Hall of Fame. 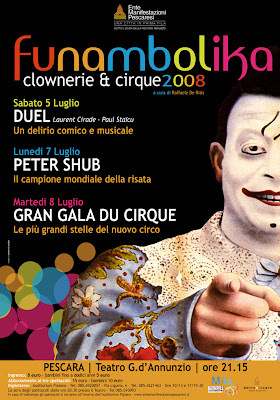 Funambolika 2008 is the 2ND edition of the summer circus arts festival focused on clowns, and conceived by Raffaele De Ritis. It takes places in Pescara, in the Abruzzo region of Italy, in the open-air Teatro D’Annunzio on the Adriatic beach. This is the same 2000-seats arena where it take places Pescara Jazz, one of the oldest and most prestigious jazz festivals in the world (www.pescarajazz.com), that is the same organizing company of Funambolika. July 8 - GRAN GALA DU CIRQUE, an evening of international circus acts (from Monte Carlo Festival, Kiev School, Moscow Circus, Cirque du Soleil appearances) including among others juggler Boul, acrobat Maxim Popazov, contorsionist-swimmer Aqua and others, around a special guest star: ANDREI JIGALOV, the king of contemporary russian clowns. With a beautiful seaside, lovely hills, the best wine and excellent fish. The theatre and hotels are just 10 minutes drive from Aereoporto d’Abruzzo (www.abruzzo-airport.it ), regularly connected with: London, New York, Paris, Frankfurt, Munchen, Bruxelles, Barcelona, Stockolm, Toronto, Kiev, Rome, Milan, etc. The Rome Fiumicino airport is 2 hours drive. Pierre Etaix built his career principally around comedy. In 1954, he moved from his native Roanne to Paris where he would make a living as an illustrator and eventually as a solo performer in cabaret and variety venues. He would also work as a circus clown in partnership with Nino Fabbri. 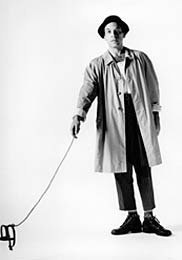 In 1954, he met Jacques Tati for whom he worked for 4 years as a draughtsman and gagman in the preparation and shooting of Tati's film, Mon Oncle, and as an assistant-director during the shooting, also playing a small, uncredited role in that film. 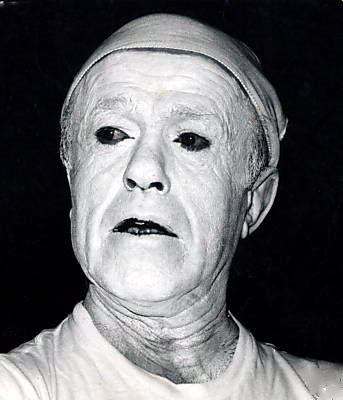 In 1961, he performed his own “number” in Tati's music-hall production, " Jour de Fête à I'Olympia". In 1961, he became a filmmaker, realising two shorts - Rupture (FIPRESCI prize in Mannheim 1961) and Happy Birthday (Oscar in Hollywood 1962) - both co-written with Jean-Claude Carrière. Between 1962 and 1970, he realised five features: The Suitor (Prix LOUIS DELLUC 1963; the Comic Film Prize of the Moscow International Film Festival, 1963), Yoyo (Grand Prize - OCIC International Festival in Venice 1965), So Long as You're Healthy (Silver Siren at the International Festival of Sorrento), The Great Love (Grand Prize of French Cinema 1969) and The Land of Milk & Honey(Pays de cocagne, 1970). 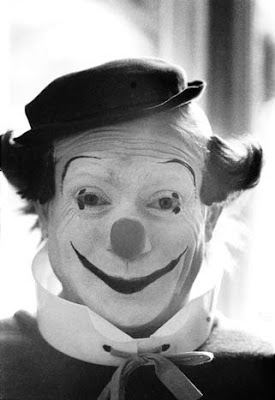 In 1971, following the release of his fifth feature, he resumed work as a clown, touting France with Circus Pinder for approximately eight months. In 1973, he wrote and acted in the stage show Whatever the Role (A quoi en joue) at the Théâtre Hébertot, winning the Society of Authors Award. The production then toured the provinces. 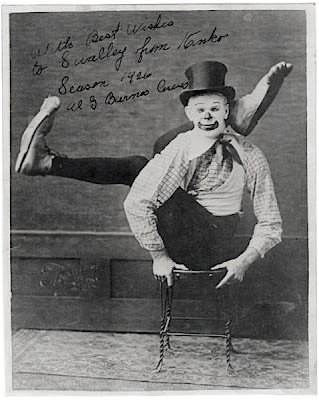 By that time he had decided, with his wife Annie Fratellini, to found the first National Circus School in France. They also produced their own duo clown routines. He is the author of many books including Hatbox, Dactylographismes, Stars System and Sketches of Jerry Lewis. In 1985, he signed his first play for the “legitimate” theatre: L 'Age de Monsieur est avancé(The Gentleman is getting on), which he adapted for television in 1987, co-starring in that version (title role) with Nicole Calfan and Jean Carmet. In 1989, he directed the first ever fiction film made in the Omnimax format: I Write in Space. More recently, he collaborated in the DVD release of the complete collection of film shorts by Buster Keaton - namely, "The Art of Buster Keaton'. His most recent books include: The Men from ...,, Let's Criticise the Camera, You Must Call a Clown a Clown, Karabistouilles, and The Clown and the Scientist with mathematician Claude de Calan. Please click the title of this post to sign a petition to (hopefully) expedite the commercial re-release of M. Etaix's films. 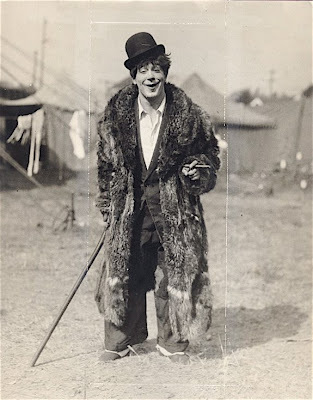 A very young Kinko Sunberry doing his comedy contortion act on the Al G. Barnes Circus in 1926. 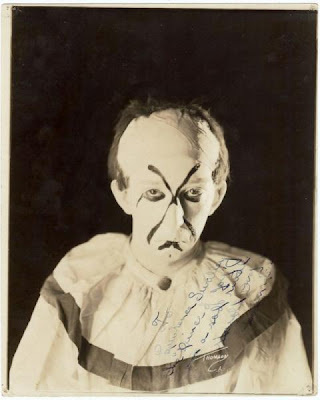 Following yesterday's post about not be able to rely on program photos be sure which clowns were on which show in which year comes this picture from the 1930 Al G. Barnes program. I'm not sure of the identity of the clown on the left. 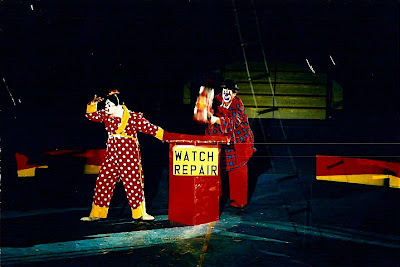 The clown on the right is Billy Rice. The clown in the center is a young Felix Adler and it is unlikely that he participated in any part of the Al G. Barnes tour of 1930. This is, more likely, a Ringling Alley photo. 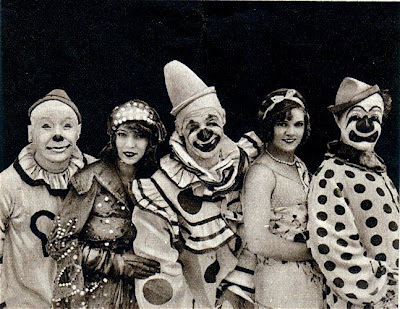 It is interesting though to see what it was that American circus clowns were doing in the days before rubber noses, when it was too warm outside for nose putty. Felix, Billy and Paul Jerome when he worked in whiteface all painted a red circle around their noses. It looks odd in photos but probably looked alright under canvas, from the seats.